Who would have thought to adapt Jonathan Lethem’s 528-page novel The Fortress of Solitude into a stage musical? Well, playwright Itamar Moses (Nobody Loves You) and composer Michael Friedman (Bloody Bloody Andrew Jackson) did. And there’s much to recommend in the resulting show, which arrives at the Public Theater after a trial run in Dallas last spring. 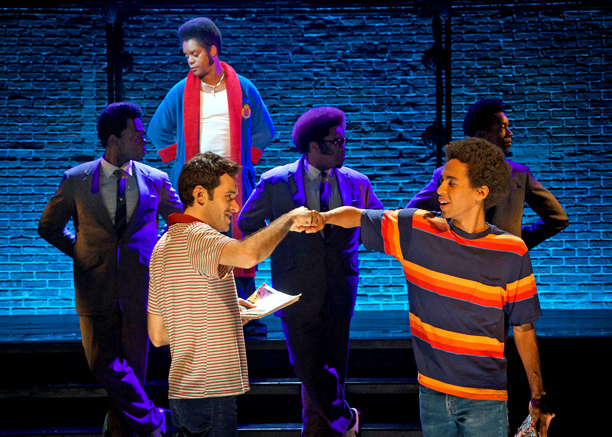 Adam Chanler-Berat and Kyle Beltran are terrific as the two leads, a white and black boy who meet in mostly black Brooklyn in the mid-’70s and forge an unlikely bond over music and comic books. And Friedman has produced some melodic winners, particularly the group choral numbers. But the book remains rather unwieldy, packing too much plot onto the slender shoulders of a single evening of theater. Read my grade-B review on EW.com.